The system is consist of two type of users, the admin and the user. The admins can create, update, delete the user. 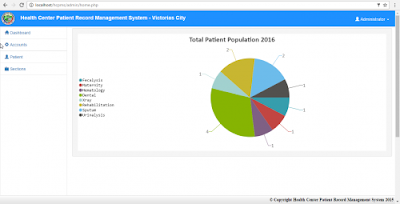 It can also analyse the total population of each individual patient and can view each patient details. The user side is divided into 8 Departments the (Fecalysis, Maternity, Dental, Hematology, Xray, Rehabilitation, Sputum, Urinalysis). When the user login, users automatically login to its assigned department. Users gather the data of patient and printed out the result. I hope that this system can help you for what you are looking for. Enjoy Coding! !